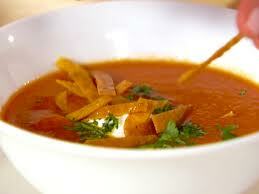 A wonderful, aromatic, savory, delicious, fulfilling soup, full of southwest flavors. Perfect for any evening, any meal, any time. This soup is meal in itself. A tortilla soup is essentially a ‘Latin’ inspired chicken based broth, thickened with corn tortillas. I like to fill mine with a wide assortment of garnishes, including black beans, pulled chicken, roasted peppers, cilantro, Mexican cheese, corn, avocado, or anything else Tex-mex that might work in a soup. Tortilla soup is a refreshing change from our normal routines, and is surprisingly easy to make. Chicken stock, a few spices, tortillas and you’re in business. Everything else is garnish, and as previously mentioned, you can add as much as you like. Personally, I like the soup a little on the thicker side, with the consistency of a bisque. Toasting the tortillas will enhance the flavor and bacon will add the smoky/salty touch. It’s delicious. I hope you like this as much as I do! In a medium sized heavy bottom stock pot, begin warming the chicken stock. Add the hot sauce, chili powder, dried chilis, cayenne pepper, onion, 1/2 the cilantro and toasted tortillas. Simmer until tortillas are beginning to fall apart. Remove from heat and let cool slightly. Transfer to a blender and blender until very smooth. Place the soup back in a pot and bring back to a very low simmer. Add the beans, corn, remaining cilantro and diced chicken. Season with salt, pepper, lime juice and additional chili powder or cayenne if you like it spicy. Ladle the soup into warm soup bowls, sprinkle the bacon, cheese and avocado on top, finishing with a dollop of sour cream. Serve right away. Poached eggs, fried tortilla strips, and extra hot sauce go well.